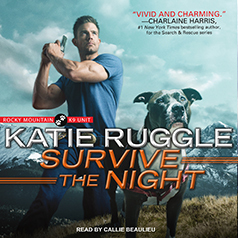 Katie Ruggle presents the third book in the Rocky Mountain K9 Unit series. All Sarah wants is to escape a life caught between ambitious crime families, but there's no outrunning her past. Her power-mad brother would hunt her to the ends of the earth . . . but he'd never expect Sarah to fight back. With Otto and the whole of Monroe, Colorado, by her side, Sarah's finally ready to face whatever comes her way.